n SATURDAY, NOVEMBER 13, 2010 in PHILADELPHIA, we brought TOGETHER former DELAWARE VALLEY ROLLER GAMES members (including members of the legendary Philadelphia WARRIORS) with PENN JERSEY ROLLER DERBY as we HONORED the GREATEST STARS in the HISTORY of ROLLER DERBY with the INDUCTION of the 2010 Class of the NRD HOF!!!! We celebrated the newest class of the NRD HOF on November 9-10, 2012 in PHILADELPHIA with an OLD-TIMERS' game featuring LEGENDARY STARS of the sport like Hall-of-Famer 'Little' RICHARD BROWN, CINDY OGBIN & ARNOLD 'Skip' SCHOEN, plus LALI O', RAY ROBLES, DAVE MARTINEZ & GINA VALLADARES!!! Also in attendance were fans from all over the country along with Hall-of-Famers JUDY ARNOLD & LARRY LEWIS, former referee & Infield Manager, JOHN 'Gootch' GAUTIERI, plus skaters PETE BOYD, 'Skinny Minnie' GWEN MILLER, JEFF HART, SUE THOMAS & MANY OTHERS!!!! JOIN US at a Roller Derby HALL OF FAME EVENT in your area SOON!!!! 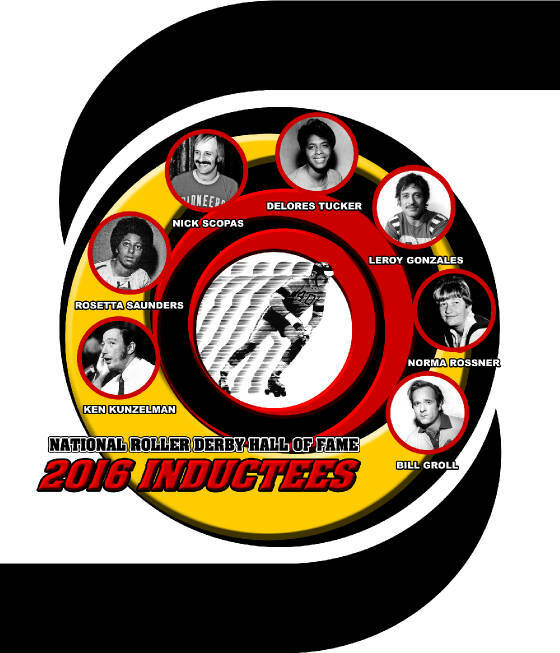 The National Roller Derby Hall of Fame is proud to announce its newest class of inductees. Those honored this year, joining the greatest names in the history of the sport, are LEROY GONZALES, BILL GROLL, KEN KUNZELMAN (into the 'Announcers Wing'), NORMA ROSSNER, ROSETTA SAUNDERS, NICK SCOPAS & DELORES TUCKER. Each 2016 inductee is considered one of the most accomplished contributors in the history of the sport, each has a unique story and the NRD HOF is proud to celebrate their careers. The 2016 inductees were selected by the NRD HOF membership in voting held during the summer of 2016. JOIN US over the next year as we CELEBRATE the newest class of HOF inductees. The National Roller Derby Hall of Fame is made possible by the support of devoted fans everywhere, the input of Roller Derby HOF members, suggestions of many others associated with the sport whose love for Roller Derby guides our efforts and with the permission and blessing of JERRY SELTZER, who's father LEO created the sport in 1935. North Carolina's fan & historian PHIL BERRIER is our DIRECTOR OF OPERATIONS, the man who makes it all run like a well-oiled machine. We are ably-assisted by historian JOE PETERS of Virginia, historian KEITH COPPAGE of California, New Jersey's KAREN GRANT and MARC STERN, another Californian originally from Chicago, Illinois. The reopening of the National Roller Derby Hall of Fame in 2004 was a result of the fundraising efforts of the Roller Derby Foundation which provides assistance to former skaters. We are constantly working to bring fans and skaters together thru Roller Derby celebrations throughout the country. We are committed to preserving the history of the Roller Derby and to honoring the accomplishments of its greatest stars. We have made Roller Derby DVDs & memorabilia available to fans around the world and those skating the new version of the sport. We are committed to sharing the history of the sport and celebrating the greatest names in the history of the sport. The National Roller Derby Hall of Fame can only continue with the support of everyone who loves the sport. Please consider purchasing a souvenir program or another piece of memorablia to support our efforts. Please join us at one of our HOF celebrations where you can meet former skaters and other fans while providing your approval of all we try to accomplish. Thanks for your support! ORDER YOURS TODAY & SUPPORT OUR EFFORTS to CELEBRATE the SPORT!!!! Please Note: 2016 Yearbook Program will be available November 27, 2016 & will be mailed then. Thank you!!!! The National Roller Derby Hall of Fame is gratified to CELEBRATE the incredible careers of seven individuals selected by the NRD HOF membership as its newest members. Texan LEROY GONZALES was Derby's 'Rookie-of-the-Year' in 1956 with the NY Chiefs. He served in the Navy for four years before returning to the banked track in '62 with a vengeance. Skating with the World Champion Mexico City Cardenales under Ken Monte in '63-'64, Leroy became one of the most unpredictable skaters on the track. Signed as Coach of the New York Bombers in the NSD in '65, he astounded everyone with his unorthodox style of skating. Frustrated with management, he quit after the '67 playoffs, then returned the following year, taking the Detroit Devils to a surprising '68 World Series title. He'd lead the Devils for the next four years, later coaching the Latin Libs. A small skater, powerful and aggressive, one of the greats of the game. BILL GROLL was born in St. Louis. An amateur boxer and AAA baseball player, Groll spent four years in the Marines before finding Roller Derby. He spent a relatively short time training, becoming Coach of the Midwest Pioneers in '69, his fourth year of skating. He'd later Coach the New York Chiefs and San Francisco Bay Bombers, being named MVP of the '73 season. A brutal blocker, Groll was one of the most beloved skaters on the track. By the 1980s in the IRSL, Groll was THE premier star of the banked track sport, always humble, always grateful to his colleagues and the fans. A natural selection by the NRD HOF membership. KEN KUNZELMAN was born in Oakland, California and found a job with Roller Derby by accident. He was at a game when the scorekeeper quit; Kenny was hired on the spot. He's egin announcing the next year and become the sport's pre-eminent house announcer over the next 25 years. He would do advance publicity for the sport and write souvenir programs. During live games from '60 thru 1985, Kunzelman was the first exposure fans had to the sport from his welcome, to hawking programs and souvenirs, encouraging fans to purchase tickets to Derby's next game, while calling the action on the track, always making each skater, the rookie to biggest star, shine. He was one of the greatest contributors behind the scenes with a love for the sport and its skaters. He know is the newest member of the Announcer's Wing. NORMA ROSSNER hailed from Chicago and began skating in 1949 during the sport's classic era. She became a veteran star in the 1950s, traveling around the world with the Derby, learning her craft. In the 1960s, she began skaing with the NSD, lending her talents to the Chicago Hawks & Hawaiian Warriors. In '66, she became Shirley Hardman's main back-up skater with the Texas Outlaws, regulating the pack and carrying th race when her captain was injured or in the penalty box. She'd later become permanent Women's Captain of both the Hawks & Outlaws, always doing whatever was needed to sell the race. Rossner helped one new skater after another learn the game and represent the sport in the most professional manner. One of the great ladies of the banked track sport. ROSETTA SAUNDERS from Atlantic City was Roller Derby's 'Rookie-of-the-Year' in 1969. She was a natural skater, rugged and graceful, who became an important contributor to the sport in 1970 with the Northeast Braves. Within a few years, Saunders' incredible style of skating powered the Red Devils, Jolters & Bay Bombers. She became the 'go to' girl of the sport, carrying the race whenever her captain was injured. She even helped out National's Northern Hawks when their girl's field was decimated by injuries. She excelled at all elements of the sport. In the 1980s, she was back with the IRSL proving she was one of the best skaters in the history of the sport. Saunders always carried herself with professionalism and class, a worthy addition to the ranks of the Hall of Fame. NICK SCOPAS was born in Queens, NY, taught himself how to roller skate, then was trained by Gerry Murray in the Derby Training School. He made his debut in 1958 and was a speed demon early in his career. A serious eye injury almost ended his career before it began, but he persevered and never gave up. He'd skate with Leroy Gonzales on the NY Bombers in the mid60s, then coach New York. Scopas always shared his experience and expertise with new skaters, all the making of an excellent coach. He'd be back with the IRDL in '71 with the Braves, then coach the Eagles & Pioneers, becoming one of the best skating coaches in the sport. For the next two decades, 'Nick the Greek' would share his knowledge of the sport with generations of new skaters, one of the true testaments of a Hall of Fame career. DELORES TUCKER was born in Bakersfield, California and was a product of the Derby Training School & Junior Derby. She'd make her debut in 1966, landing on the Bay Bombers in '68 becoming Captain Joan Weston's main back-up skater. She'd be Playoff MVP in '69, season MVP in '71, before becoming permanent Women's Captain of the Bombers later in the year. Rugged and strong, Tucker could carry the race with the best of them, although she always shied away from the spotlight, letting other get all the glory. She'd win the season MVP award in '73, establishing herself as one of the best in the game. She'd continued to skate in the game for another decade. Her dedication to the sport was stellar, her commitment to excellence never waivered. One of Derby's most underrated and beloved skaters. 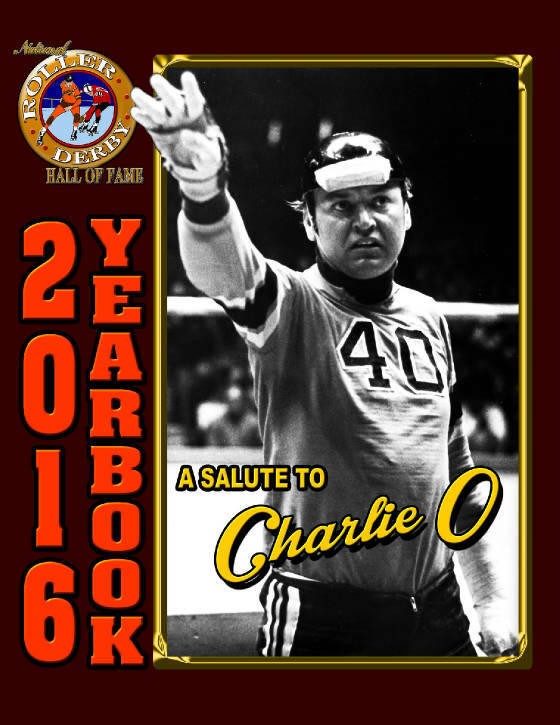 With great sadness, the National Roller Derby Hall of Fame announces the sudden death of legendary star, CHARLIE O'CONNELL. Born in New York City on May 7, 1935, O'Connell first discovered the sport because his grandmother was a fan. At Madison Square Park in NYC (23rd Street & Fifth Avenue), O'Connell and friends Frank Macedo & Frankie Fren would 'play' Derby. Charlie first began training in 1952, was signed by the NEW YORK CHIEFS and won 'Rookie-of-the-Year' honors in '53. Temperamental and erratic, O'Connell was signed by the CHICAGO WESTERNERS (skating in Australia in '55) before being traded to the BAY BOMBERS in 1957. Skating under 'Wild BILL' REYNOLDS, Charlie found his niche wearing #40 alongside ANN CALVELLO who taught him to see the bigger picture of the Derby industry. When the Bombers skated in NYC in '58, O'Connell & Reynolds, along with Calvello & MARY GARDNER terrorized the hometown Chiefs. After JERRY SELTZER took over operation of the Derby in '59, O'Connell became coach of the SAN FRANCISCO BAY BOMBERS with the pivot position being created for specifically to utilize his talents. O'Connell would become the premier male star of the sport for the next fifteen years. His most significant contribution to the sport was making the game about the men rather than the women which had been Derby's traditional 'calling card' for its first twenty-five years. His battles with KEN MONTE & BOB WOODBERRY were legendary. 'Mr. Roller Derby' would briefly retire after the '67-'68 road tour, then continue to be the dominant male skater in the IRDL. He'd lead the newly-reorganized NEW YORK CHIEFS in the Fall of '71, winning the title for the team before returing to the Bay Bombers in the summer of '72. He'd continue to coach the BAY BOMBERS till the end of the original Derby in December, '73. He'd fulfill his contract with the L.A. T-BIRDS in the short-lived ISC in '74 before leaving the game. In 1976, he was back leading the BAY BOMBERS in the newly-formed IRSL before retiring permanently after the '78 campaign. Roller Derby's greatest star never lookd back. He owned and managed a number of apartment buildings in Northern California. O'Connell was married three times and had two children. His last marriage, to another Hall-of-Famer JUDI McGUIRE, would last 35 years till his death. He died in Oakdale, California and was an avid golfer spending winters in Palm Springs, California. The entire Roller Derby world mourns the loss of its greatest star. May he rest in peace with the gratitude of colleagues and fans the world over.